Containing an EDT & Shower Gel the Bluebeards Revenge gift set is designed to keep the manliest of men smelling his best at all times. The EDT has a distinctive, fresh fragrance opening with ozone notes and accented by Sicilian bergamot and Ligurian basil. Watermint makes up the heart and the base notes include Madagascan vanilla, sandalwood, patchouli, oakmoss and musk. It smells really nice and fresh and is perfect for everyday wear. The shower gel is nice too. Used together the two products complement each other well. Looking for gifts for music lovers? Then why not gift them E1 earphones. Beautifully made and comfortable enough to wear all day, these headphones will help them enjoy their music even more. The headphones come with interchangeable earphone tips for 'the' perfect fit and the cables are 'two-toned' to easily differentiate left from right. The cables are tangle-resistant, lightweight nylon cords and the in-ear earphones offer up to 12 hours of continuous play. Mr.H liked the way you can personalise the sound (the EarPrint Technology used in the earphones). He found the fit comfortable and the sound quality pretty good. The carrying case is a bonus. The only improvement he would love to see is a reduction in the size of the controller. Overall, a really good earphone. HYMM for Men is a range of daily care products for men created by Amway. Featuring a number of products like shave gel, shave balm, razors, hair & body shampoo, deodorant, EDT etc. the range is ideal for everyday use. So, why not buy your man some lovely products from this range - it has everything he needs for his skincare routine. 2-in-1 Hair & Body Shampoo (£6.50) - A 2-in-1 formula created with Water Mint Extract and Sea Minerals, this product cleanses both body & hair. It has a light fragrance that helps to keep the body and hair smelling fresh. Energizing Daily Face Wash (£10.25) - A mild formula with skin-neutral pH and formulated with Aloe Vera, Vitamin E and Chamomile, which moisturise and soothe the skin. The face wash includes Ginseng extract that tones, refreshes and re-energizes the skin. The face wash is suitable for all skin types, including sensitive skin. Aqua Eau De Toilette (£28.25) - The EDT opens with a splash of Sea Water accord, energizing Grapefruit and Lemon. The heart notes are a combination of marine freshness with a blend of Sea Salt, Lavender and Violet Leaves while the base of Patchouli, Lorenox and Cedarwood enriches the fragrance with a casual masculine sensuality. A wonderful scent comes recommended by Mr.H. Buff is not just about bandanas and snoods. They have an impressive range of scarfs, hats, quirky balaclavas, neckwarmers and other headwear. The acrylic neckwarmer and hat featured in this post would make for an excellent gift in the colder weather. The beautiful denim coloured hat (£30.76) is made from 100% Acrylic and has a fleece band. The fit is comfortable. The neckwarmer (£30.76) is fully fleece lined and along with the hat it keeps the wearer warm and protected from the wind. This mix 'n' match set from Buff scores well on style, comfort and efficacy. This one is for the outdoor lover. The Hydro Flask food flask keeps cold foods cold and hot foods hot, The concept behind the food flask is the same as the Hydro Flask water bottle. It is made of durable 18/8 Pro-Grade Stainless Steel construction and the TempShield insulation eliminates condensation and keeps food piping hot or ice cold as when you packed it. Christopher Courtney London is an award-winning luxury skincare brand who are committed to developing effective and high performance all-natural, toxin-free, eco-friendly and aromatherapy professional skincare products. They have a range of men's face and body care products which could make a lovely present. Featured in this post is an all in one men's body polish and shower gel that helps to remove dead skin cells moisturises and hydrates the skin, leaving the skin renewed and healthy. The key ingredients in the product are Aloe barbadensis (known for soothing and healing properties), Pantheno l (boosts skin metabolism), Vitamin E (powerful anti-oxidant), Hydrolysed Oat Protein (rich in nutrients and creates a protective film on the skin) and Superfruits (a concentrated blend of five botanical extracts & a natural source of Alpha Hydroxy Acids). 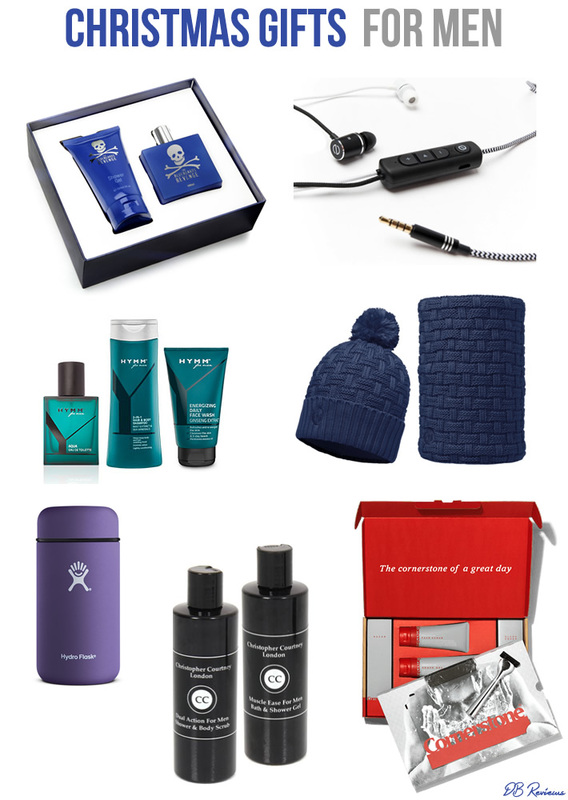 This gift set contains a range of quality shaving products and a personalised chrome-plated razor from Cornerstone. The razor has five super sharp, fine blades, optimally spaced to increase shave performance and reduce clogging, an Aloe Vera strip to help the blades glide smoothly, as well as a new precision trimmer blade for those hard to reach areas. Made from Japanese chromium steel to reduce micro-corrosion of the cutting-edge the blades are coated with a layer of titanium and diamond grade carbon to ensure the cutting edge stays sharper for longer. This novelty Xmas T-shirt from Lush T Shirts would make a cool gift! Made from 100% cotton and with a white printed beard graphic printed on the front near the neckline, this red, men's T shirt would be perfect for Christmas. It fits well, looks nice and festive, is of good quality and a bargain price. The T-Shirt is priced at £14.99 and can be ordered from www.lushtshirts.co.uk. Lush T-Shirts currently have a special offer - 4 T Shirts for £40! It is a very good deal, so do check out their website.